Photovoltaics work by converting light into electrical energy. A photovoltaic solar cell works by utilising two thin pieces of silicon crystal placed on top of each other. The top layer of silicon is specially treated so that its atoms are unstable and it has electrons that it no longer needs. The bottom layer has also been treated, however, this treatment means that the layer’s atoms require an electron to fill them. When exposed to light, the electrons are able to move freely from the top layer to the bottom layer. The process of doing this then allows electricity to be generated. Do I have to switch solar PV panels on every day? No, solar PV panels are always switched on. How many photovoltaic cells will I need? An 8.5 m² area of photovoltaic cells is sufficient to cover the average power consumption of one person, multiplying this number by the number of people in your household will give you a good idea of how many photovoltaic cells. How much sunlight do photovoltaics need? Whilst the UK does not benefit from all-year round sunshine, direct sunlight is not necessary for photovoltaics and they will work in cloudy and overcast weather. What are photovoltaics made of? Our photovoltaic collectors are made from high-grade, corrosion-resistant materials including glass, aluminium, copper and stainless steel. What can photovoltaics be used for? 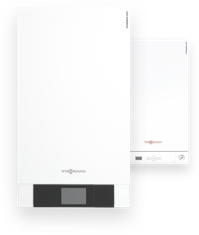 Viessmann solar PV collectors are designed to utilise the free heat from the sun to heat your domestic hot water supply and heat your property. The Feed-In Tariff is a scheme from the UK Government which encourages the use of renewable energy sources by paying you for every kilowatt hour of energy which you feed back into the grid. Where can photovoltaics be installed? Our range of photovoltaic solar collectors can be installed on the roof or walls of your property. However, they are not suitable for installation on roofs which are heavily shaded and are best placed for installation on south-facing roofs. Also, if you live in a listed building or a conservation area, the regulations your property are subject to can sometimes pose a problem. Can solar PV panels add value to my property? Yes, research from YouGov found that homeowners ranked energy efficiency as the third most important reason to buy. Whilst research from the Energy Saving Trust found that 35% of people said that they would be willing to pay more for a home which received a proportion of its electricity from a renewable source.